It is a branch of dermatology that deals with the scientific study of the hair and the scalp. It can be used in forensic studies of hairs to find suspects. There is a trichology center in Pune where top trichologist in Pune study the cases related to hair loss. A good trichologist in Pune can also help you with your hair loss treatment. Today, hair transplant in Pune is available at our centre at a very reasonable cost. The hair transplant cost is not much in our center and is much affordable than the hair transplant cost in India with other hair transplant centers. If you want to get your hair removed from the skin then the laser removal cost in Pune at our centre is also not much. We ensure you a fast hair growth treatment with the latest equipments equipped with latest technology. In today’s scenario, we take immense pride in saying that the best hair transplant in Pune is done at Skin and Surgery International as we can say that we have the best hair surgeon in India. The process of hair transplantation surgery is quite delicate with the need for precautions to be taken. The duration required for the surgery is about 4 hours and the doctors treat the scalp with certain antibacterial chemicals and then shampoo it. In this type of surgery, a strip of hair is harvested from the hairy area of the scalp, or the donor strip, measuring 1-1.5 x 15-30 cm. The surgeons take great care while removing the surplus fatty tissue to make sure that the vital follicular cells come to no harm. The surgeon then pierces the graft receiving sites with a fine needle by using binocular microscopes for a close inspection. They are further arranged as per a predetermined density and pattern and the individual grafts that are placed on the problem patches. The surgeons consider 50 grafts per square centimeter to be enough for providing acceptable hair density. The method of hair transplantation and restoration can offer outstanding results when done properly and it becomes difficult for anyone to tell whether the hair is natural or been transplanted. Hair transplantation surgery is also believed to be convenient because it takes quite less time to separate the follicular units and their transplantation on the problematic areas. Today, patients looking out for hair loss treatments are getting better options in the form of hair restoration technology. Earlier, around 25 to 30 years before, the surgeons used to treat hair loss with the help of hair plugs. The hair plugs possessed grafts having about 15 to 25 hairs in each which gave the hair transplant an extremely unnatural and obvious look. We at Skin and Surgery International, use micro grafting through FUE for achieving great results. In this procedure, the individual hair follicles are extracted from an area on the scalp and the hair follicles are reinserted into the hairline. A local anesthesia is generally given for performing this type of hair grafting surgery. 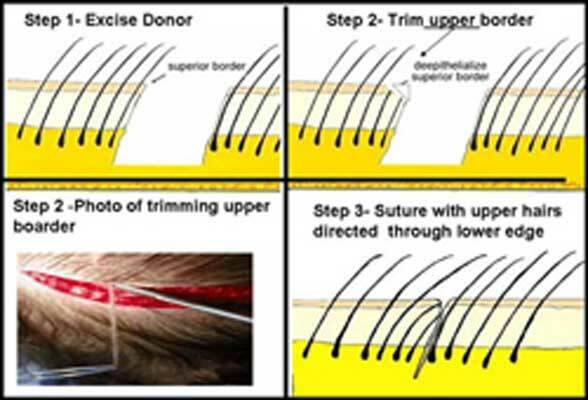 Follicular Unit Extraction Follicular Unit Transplantation: This method is similar to FUE wherein hair follicles are transplanted from the scalp of a person and then transferred into the balding area. Usually, a group of hairs known as follicular units are selected by the surgeon which is 1, 2, 3 or 4 hairs occurring in natural groups. The hair transplant specialist at Skin and Surgery International follows the above two methods for hair transplant that are considered to be the latest methods for such transplants. The surgeons use this procedure mainly on those patients who have had hair transplant procedures earlier and look for enhancement in the disguise of their donor scar. This is also used in patients while they undergo their first hair restoration procedure. Trichophytic Closure is especially helpful for corrective or repair work. Patients having short hair can opt for this procedure as an alternative to FUE. There are many options to choose from when it comes to repairing hair loss. Although hair transplantation is the only permanent solution, there are some temporary solutions available as well. The most advanced method used today is Follicular Unit Extraction. This is the preferred method because its results are the most natural looking.